It's days that this that make it fun (and easy) to be an Arsenal fan. I'm sure days like these also make it easy to be an Arsenal player too. That's the sort of performance we needed, the performance we were looking for and the performance we knew this team were capable of when they started to click. It was a near perfect game from Arsenal's point of view. Of course, it would have been closer to perfect if Melo had been punished for his horror tackle on Alexis Sanchez, but as far as I've seen Sanchez is fine and we got the three points. So joke is on Melo Yellow. First, he needed a run of games to give him the chance to not only find his place in the Arsenal team, but to find is own form, and he's getting that run of games now. Deservedly. Second, he is being deployed in his 'natural' position at the moment. Up front he has the speed, movement and obvious eye for goal. 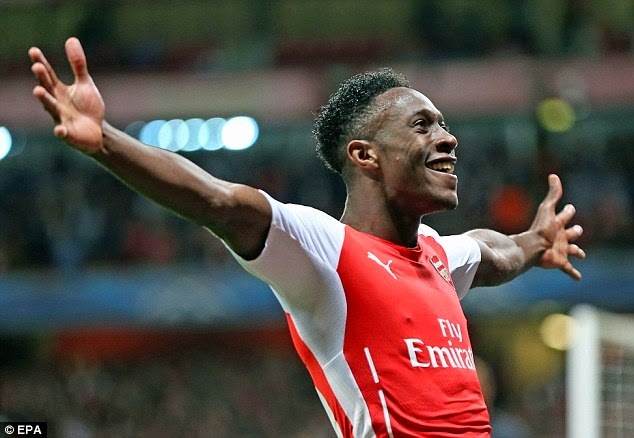 I haven't seen a striker able to take his chances as well as Danny Welbeck in quite some time at Arsenal. Third, he has so much quality around him that it would be shocking for him not to feed off the kind of support he's been getting recently. A couple of assists from Ozil, a goal and an assist from Sanchez and an assist from The Ox. The big boys really showed up Wednesday night. Let's not get too excited and think all our problems are solved with a Welbeck hatrick, but it's a hell of a start and if the chemistry amongst the lads keeps building then we are in for a treat. As far as the comparisons between Giroud and Welbeck, they are two different players really. Giroud holds the ball up and plays his team mates in - something Ramsey really fed off. Perhaps with Welbeck up front Ramsey isn't sure of his role? Danny Welbeck is the old school striker. Reminds me a bit of Kevin Campbell in the '90s. He's got great ability to read the pass and make the right run, almost every single time. What makes that even better is that he can not only get a shot off from pretty much any position his body is in, but his finishing is lethal. When Giroud comes back around the holidays, the manager will have a serious decision to make about what to do with them both. It would be interesting to see them play together, as they certainly wouldn't clash with each other. To add yet another creative, hard working player like Giroud into the mix would be exciting. Lovely goals, lovely football. Makes you glad to be a Gooner, and if you're like me you're sitting there with a calm smile on your face thinking everything is right with the world again. I would love to say that we're playing the Russians from London at the right time - a time when they are full of injuries and their form has dipped. Except that's not the case at all. We're going to the toilet in Fulham on Sunday to play a team that is in top, top form at the moment, and are showing no signs of letting up. Our preparation could not have gone any better, having got that result against Galatasaray to give us some confidence. However, need I remind anyone of the 6-0 drumming we received last season? I'm not being pessimistic, only realistic in the fact that we are going to have to be near flawless against the most hideously obnoxious collection of players and fans the world has ever created. Let me tell you something about Chelski. Chelsea fans are a lot like Ebola. Nobody wants to be near it, but it keeps spreading across the planet, popping up here and there. Chelsea fans are the sort of fans that you can't talk to about anything that happened in football before 2004 because, for all intense and purposes, Chelsea really didn't exist before 2004. Chelsea were the first team to come right out and ruin football as we know it. In comes the Russian mafia, buys the team and pumps billions into the club so they can buy every player ever born, pay them obscene amounts of money, then loan them out. Financial Fair Play was created because of Chelsea. Disinfectant was invented because of Chelsea fans. The wankers in blue is something the world could have done without. But I digress, let's enjoy our new boy's hatrick and leave the Chelski hating for another day. It's just so fun to hate Chelski. Ooh To Be A Gooner!